Photo by Joe Brusky The water protectors at Standing Rock offer us much-needed hope that people power can effect real change. The peaceful demonstrations by water protectors — as many gathered there prefer to be called — was met with brutal violence. They have been pepper-sprayed by private guards and state security personnel, attacked by dogs, shot at with rubber bullets, hosed down with water canons in sub-zero temperatures, arrested, and threatened with lawsuits. Yet, they prevailed. On December 4, the Army Corps of Engineers announced that it would not grant the pipeline builders, Energy Transfer Partners, the easement permit required for the pipeline to cross under the Missouri river. 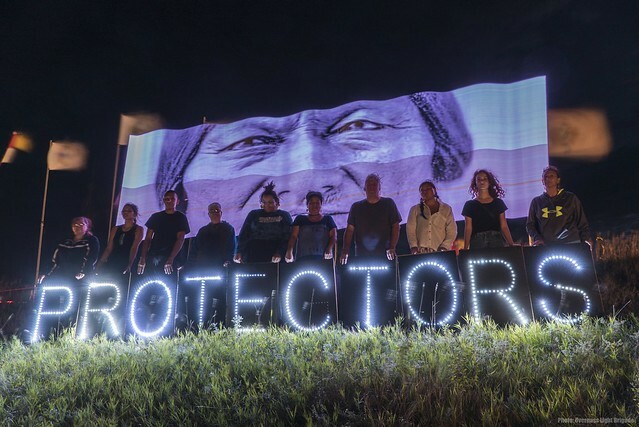 This, of course, isn’t the end of the story, or the pipeline, but the water protectors, who have consistently stayed on message about their movement being peaceful and prayerful, offer us much-needed hope that people power can effect real change. On January 2, 2016, armed militants seized the headquarters of the Malheur National Wildlife Refuge in Harney County, Oregon, their intention being to turn the refuge, i.e. public land, over to private ranchers, loggers, and miners. During the 41-day occupation of the isolated bird sanctuary in rural eastern Oregon, the militants, led by ranchers Ammon and Ryan Bundy, had vowed that if the government tried to remove them from the refuge it would risk a “conflagration so great, it cannot be stopped, leading to a bloody, brutal civil war.” According to the US Fish and Wildlife Service, the occupiers left the refuge with $1.7 million in damages, which included digging trenches and an improvised road around several ancient Burns Paiute Tribe burial grounds near the headquarters. While it will take some time for Malheur to recover, the occupation appears to have reinvigorated the refuge’s conservation motives. The occupation set off a surge of public support for the Malheur refuge, with donations and visitors pouring into the sanctuary. On October 28, a federal jury found all seven defendants involved in the armed occupation not guilty of the charges leveled against them. Photo courtesy of Goldman Environmental Prize Cáceres was the general coordinator of COPINH, a group that has been campaigning for the land and decision-making rights of the indigenous Lenca people. 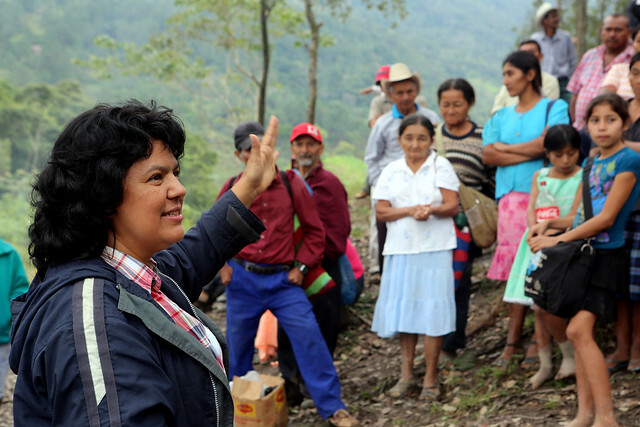 On March 3, 2016, Honduran indigenous Lenca leader Berta Cáceres was shot dead in her home town, less than a year after she was awarded the 2015 Goldman Environmental Prize in recognition of her courageous efforts to save her community and land from mining and other mega-development projects. Cáceres was the general coordinator of COPINH (the Civic Council of Popular Indigenous Organizations of Honduras), a group that has been campaigning for the land and decision-making rights of the Indigenous Lenca people. Less than two weeks after her assassination, another COPINH organizer, Nelson García, was shot dead by two gunmen as he arrived at this mother-in-law’s house for lunch. Murders of grassroots environmental activists — who are struggling on a daily basis to defend their land, forests, and rivers against the expansion of large-scale agriculture, dams, mining, logging, and other threats —have become increasingly common across the world. 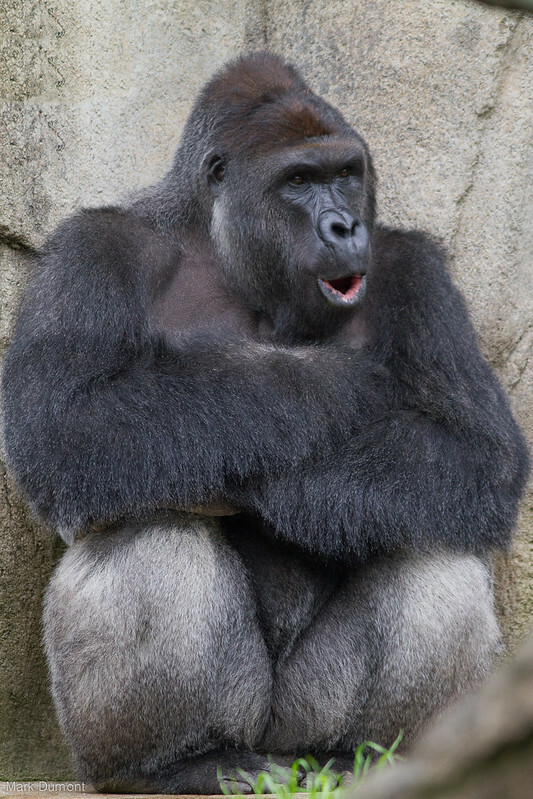 According to the latest report by Global Witness, a group that exposes human rights abuses driven by the exploitation of natural resources, 2015 was the deadliest year on record for environmental activists. The report documents 185 killings across 16 countries last year, a 60 percent increase from 2014 and an average death rate of more than three people per week. On March 17, SeaWorld said that it would no longer breed orcas at any of its captive facilities. In the words of SeaWorld’s President and CEO Joel Manby, this will be “the last generation of orcas in SeaWorld’s care.” The announcement represented long overdue recognition by SeaWorld that keeping whales in captivity is cruel and abusive and must end, and was an important step toward ending whale suffering and the inhumane treatment of captive orcas. But as, Dave Phillips, director of Earth Island Institute’s International Marine Mammal Project says, while this is some progress, it’s not nearly enough. The announcement does not end the threat that SeaWorld and other captive facilities pose to dolphins, whales, and other marine mammals who will still be kept in captivity and continue to be captured from oceans around the world. he might harm the child for coming into his home. Photo by Greg McFall/NOAA Fishes and coral at Rapture Reef, French Frigate Shoals, Papahānaumokuākea Marine National Monument. President Obama expanded the area of the monument in August to 139,797 square miles. This year has been a good one for marine protection. In August, President Obama created the country’s largest contiguous fully protected area with the expansion of Papahānaumokuākea Marine National Monument. At 139,797 square miles, the monument, which is home to coral reefs and seamounts and more than 7,000 marine species, now comprises an area larger than all the United States’ national parks combined. Just a few weeks after the announcement, on September 15, the president inaugurated the Northeast Canyons and Seamounts Marine National Monument — the Atlantic’s first-ever marine monument. The new monument, which lies about 130 miles off the southeast coast of Cape Cod, protects 4,913 square miles of marine ecosystems. In October, after a decades-long push to protect the Ross Sea — a 1.9 million square mile stretch of ocean off the coast of Antarctica — a coalition of 24 countries agreed to provide international protection for 598,000 square miles of water and the area was finally declared a marine reserve. The Ross Sea is home to some of the most productive waters in the Antarctic and is known as the “Last Ocean” because it’s one of the most pristine pieces of the ocean left on Earth. And most recently, on December 20, Obama permanently banned new oil and gas drilling in most US-owned waters in the Arctic and Atlantic oceans. Though the ban — which would affect federal waters off Alaska in the Chukchi Sea, most of the Beaufort Sea, and the Atlantic from New England to the Chesapeake Bay — could be challenged by Trump in court, Obama instated it using a 1953 law that allows presidents to block the sale of new offshore drilling and mining rights. That law makes it difficult for a president’s successors to reverse the decision. The announcement of the $66 billion Monsanto and Bayer merger in September this year was greeted with dismay by much of the sustainable food and farming community. The merger, which would create one of the largest agrichemical companies in the world, has sparked fears of further corporate takeover of global food systems. The two companies are already among the biggest agrichemical corporations in the world, with US-based Monsanto accounting for 26 percent of the global seeds market and the Germany-based Bayer providing roughly 17 percent of the world’s pesticides. Together, the companies are expected to control 29 percent of the world’s seeds and 24 percent of the world’s pesticides. Should the merger — which is subject to regulatory approval in Germany and the United States — go through, it would not only eliminate competition for certain seeds, fertilizers, and pesticides, but also allow two of the most powerful corporations in their fields to develop seeds and genetically engineered traits that work only with chemicals they manufacture. Photo by Dave Sizer While the 400 ppm mark is in some ways a symbolic milestone, most climate scientists agree that crossing it poses serious climate ramifications. This summer, for the first time since before the Ice Age, carbon dioxide levels in the atmosphere failed to drop below 400 parts per million. Scientists say they are never going to fall below that threshold again in our lifetimes. While the 400 ppm mark is in some ways a symbolic milestone, most climate scientists agree that crossing it poses serious climate ramifications. What’s especially troubling about the current scenario is that the rate of CO2 increase in recent decades is more than 100 times faster than anything observed in the ice core record, which goes back 800,000 years. (This year, incidentally, has seen by far the warmest global temperatures on record.) 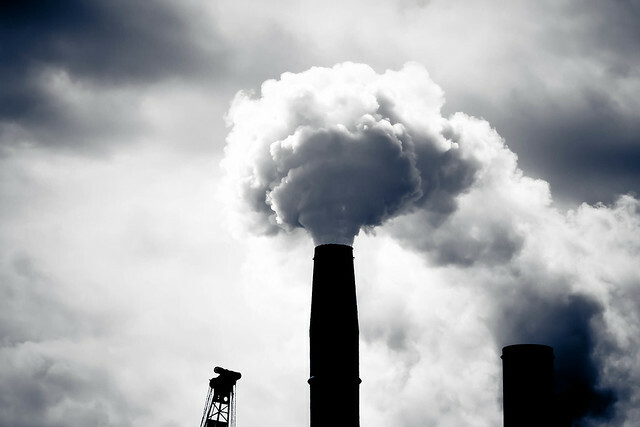 This high rate of increase will continue as long as fossil fuel consumption remains at its current level worldwide. As 2016 draws to a close, the global energy markets brought in news to cheer about: Solar power, for the first time, is becoming the cheapest form of new electricity. According to fresh data from Bloomberg New Energy Finance (BNEF), unsubsidized solar is beginning to outcompete coal and natural gas on a larger scale, and new solar projects in emerging markets are costing less to build than wind projects. “Solar investment has gone from nothing — literally nothing — like five years ago to quite a lot,” Ethan Zindler, head of US policy analysis at BNEF, told Bloomberg News. “A huge part of this story is China, which has been rapidly deploying solar” and helping other countries finance their own projects. Can we dare to hope that the US will follow suit? Maureen Nandini Mitra, Editor, Earth Island Journal . In addition to her work at the Journal , Maureen writes for several other magazines and online publications in the US and India. A journalism graduate from Columbia University, her work has appeared in the San Francisco Public Press , The New Internationalist , Sueddeutsche Zeitung , The Caravan and Down to Earth .